Mega Man 8, called Rockman 8: Metal Heroes (ロックマン８ メタルヒーローズ) in Japan, is a platforming run-and-gun developed by Capcom and released for the Sony PlayStation in 1996 and ported to the Sega Saturn shortly thereafter. It is the only game in the "classic" Mega Man series to appear on a Sega console (not counting the compilation Wily Wars). 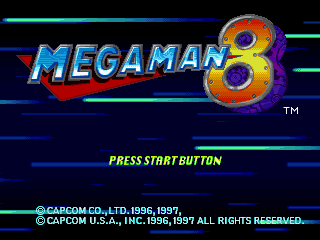 The US version of the Saturn version is called Mega Man 8: Anniversary Collector's Edition, in line with the various collector's versions of the PlayStation release. The plot for Mega Man 8 is presented by both fully-animated full motion video (FMV) cutscenes and in-game text. Taking place in an ambiguous year in the 21st century (20XX), the world recovered from Dr. Wily's seventh attempt to take over the world. Up in space, however, a battle between two mysterious robots nears its climactic finish, causing one of them to careen through the solar system and toward a familiar blue planet. Meanwhile, Mega Man and Bass were doing battle over the city on their respective mechanical canine companions, Rush and Trebel, much to Mega Man's disappointment. When Roll arrives on the scene, Mega Man manages to get away as Bass' buster winds up tangled with an elevator cable. He vowed to battle Mega Man one more time. Aboard Roll's hover car, Dr. Light informed Mega Man of a strange energy reading coming from a skull shaped island located in the Pacific Ocean that used to be one of Dr. Wily's many bases. The game begins with Mega Man arriving on the island in search of the energy signal. Mega Man 8 plays similar to its predecessors: Mega Man can run, jump, slide, shoot, charge his Mega Buster, and change weapons (either in-game or while paused). Like Mega Man 7 players are restricted to only 4 Robot Master stages for the first half of the game, upon defeating all 8 Robot Masters, players may go to the final stages of the game. The sound production differs from the previously released PlayStation version, with varying sound effects and an altered set of BGM. The PlayStation version, however, is the one represented for the game's official soundtrack release. Interestingly, neither Mega Man X4 nor Mega Man X3 before it were affected this drastically. The theme for Tengu Man's stage is a completely different composition. Because his original theme is referenced in future Capcom media releases, the reason for the creation of this theme remains unknown. Cut Man and Wood Man cameo as minibosses exclusively for this version of the game (complete with arrangements of their original stage themes) in Duo and Search Man's stages, respectively. The stages are physically altered to accommodate these encounters and award the player a Bolt upon their defeat (similar to how other minibosses relinquish Rush abilities). This affects the distribution of hidden Bolts for both stages, as the total count remains the same. An exclusive bonus mode unlocked upon beating the game includes fan submitted boss character postcards (beyond those seen in the game's credits), official illustrations, and both a sound and voice test. This is in place of the Japanese-exclusive "Game Information" movie found in the PlayStation version that showed a trailer for both Rockman Battle & Chase and Super Adventure Rockman. Mega Man 8, like Mega Man X4, suffered from a localization job which involved subpar English language voice acting. This included instances of Dr. Light's voice actor, Jack Evans, messing up his lines, causing him to say "You must recover all the energy immediately, M-Mega Man!" or say Dr. Wily's name as "Dr. Wowy" through an impersonation of Looney Tunes character Elmer Fudd. Main article: Mega Man 8/Magazine articles.